Background: The crocidolite variety of asbestos is banned. However, chrysotile, which is not prohibited, is still used in developing countries in making products such as clutch plate. Fourteen workers from a small-scale clutch plate-manufacturing factory were analyzed for asbestos-induced lung disease as one of their colleagues had expired due to asbestosis. Aims: This study was conducted to evaluate the awareness of workers, the prevalence and type of asbestos-induced lung disease, and the sensitivity and specificity of diffusion test. Materials and Methods: History, examination, chest radiograph, spirometry with diffusion, and high resolution computed tomography (HRCT) thorax was performed in all the workers. The diagnosis of asbestos-induced lung disease was suspected on the basis of HRCT. This was subsequently confirmed on transbronchial lung biopsy (TBLB). Results: None of the workers had detailed information about asbestos and its ill effects. Eleven out of 14 (71.42%) workers had asbestos-induced lung disease. All 11 had small airway disease (SAD). Three had SAD alone, 6 had additional interstitial lung disease (ILD), and 2 patients had additional ILD and chronic obstructive pulmonary disease. 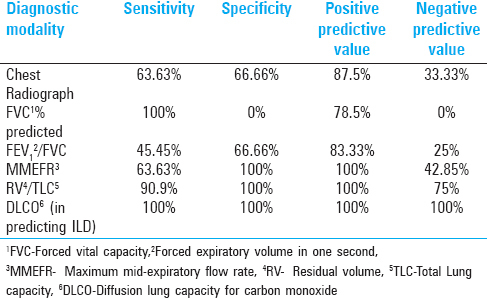 Sensitivity and specificity of residual volume (RV) or total lung capacity (TLC) for detecting SAD was 90% and 100%, respectively, and that of diffusion capacity of lung for carbon monoxide (DLCO) for detecting ILD was 100%. Conclusion: The awareness about asbestos in small-scale clutch-plate manufacturing industry is poor. The usage of chrysotile should be strictly regulated as morbidity and mortality is high. DLCO and RV/TLC are sensitive and specific in detecting nonmalignant asbestos induced lung disease. There are two types of asbestos fibers, namely, serpentine and amphibole. Serpentine fiber has only the chrysotile variety. The amphibole group of asbestos includes crocidolite, amosite, anthophyllite, tremolite, and actinolite varieties. , The use of crocidolite and products containing this fibre and spraying of all forms of asbestos are prohibited under the International Labour Organisation (ILO) Convention concerning Safety in the Use of Asbestos (No. 162) since 1986. More than 50 countries, including all member states of the European Union, have banned the use of not only crocidolite but also all other forms of asbestos. Chrysotile, which is not prohibited under the ILO, is still used in many developing countries, accounting for 90% of world's asbestos production. , Although chrysotile is "safer" than crocidolite, significant mortality has been associated with exposure to chrysotile asbestos. We studied chrysotile asbestos workers of a small-scale clutch plate-manufacturing factory as one of their colleagues had expired 1 year ago (sentinel case) due to asbestosis. A prospective evaluation of 14 workers from a small-scale clutch plate-manufacturing factory was performed after obtaining Institutional Review Board clearance. As per the industrial laws, only factory inspectors are allowed to visit the factory. Hence, a report from social security officer was taken and the workers were called to the hospital for evaluation. As per the report, these workers worked in a 200 m 2 area with adequate ventilation, but without protective gears on hydraulic machine with the material, as shown in [Figure 1]. The aims of the study were to evaluate (1) if the workers were well-informed about asbestos and its handling in a small scale-clutch manufacturing factory, (2) the prevalence and type of asbestos-induced lung disease from a small scale-clutch manufacturing factory, and (3) the sensitivity and specificity of residual volume (RV) to total lung capacity (TLC) ratio, i.e., RV/TLC and diffusion capacity of lung for carbon monoxide (DLCO) in detecting nonmalignant asbestos-induced lung disease. All the 14 workers underwent a detailed history taking and examination. The history included the following: (1) information that the substance they are working with is a hazardous substance and the extent of its hazardousness; (2) information about preventive measures; (3) if any checkup was advised by the employer; (4) respiratory symptoms; (5) duration of work; (6) smoking Index: one bidi was taken as one cigarette in bidi smokers; and (7) atopy. They underwent general physical examination which included clubbing and exercise-induced desaturation. Respiratory system examination was also carried out in detail. Routine biochemical and hematology investigations were performed for all the patients. Spirometry with diffusion test was performed with Medisoft/MorganScientific SpiroAir in all the patients. It was performed and interpreted as per the American Thoracic Society (ATS) guidelines. Parameters noted were forced vital capacity (FVC), forced expiratory volume at 1 second (FEV 1 ), FEV 1 /FVC ratio, maximal mid-expiratory flow at 25-75% (MMEF 25-75% ), RV/TLC, and DLCO. Chest radiograph and high resolution computed tomography (HRCT) was also carried out in all the cases. 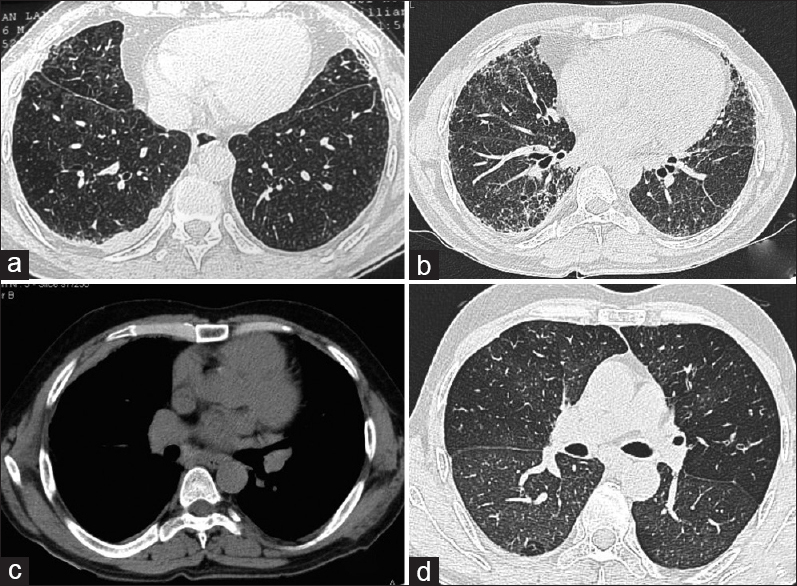 The diagnosis of the possible absence or presence of lung disease was based on HRCT. Patients were classified as small airway disease (SAD) if the HRCT showed mosaic attenuation and/or centrilobular nodules, ILD if there was interseptal thickening and/or honeycombing, and chronic obstructive pulmonary disorder (COPD) if there was centrilobular emphysema. If HRCT showed evidence of airway and/or interstitial involvement, the workers were subjected to bronchoscopy and transbronchial lung biopsy (TBLB). The asbestos-induced lung disease was confirmed if there was presence of asbestos bodies on TBLB. Asbestos bodies indicate that there was significant asbestos exposure, thereby indicating asbestos-induced lung disease. None of the workers had any information about preventive measures. None of the workers had ever done preventive health checkup. Only 4/14 workers were aware about the harmfulness of the substance they were handling. However, they did not know the extent of detrimental effects it can cause. Four out of 14 workers tied a cloth around their nose intermittently. None of them were provided with any protective gears. None of the workers were aware about detrimental effects related to smoking combined with asbestos. Eleven out of 14 workers were diagnosed to have asbestos-induced lung disease. The details about these workers are given in [Table 1]. Their mean age was 42.31 ± 4.16 years, and the mean duration of exposure in the factory was 24.23 ± 4.2 years. 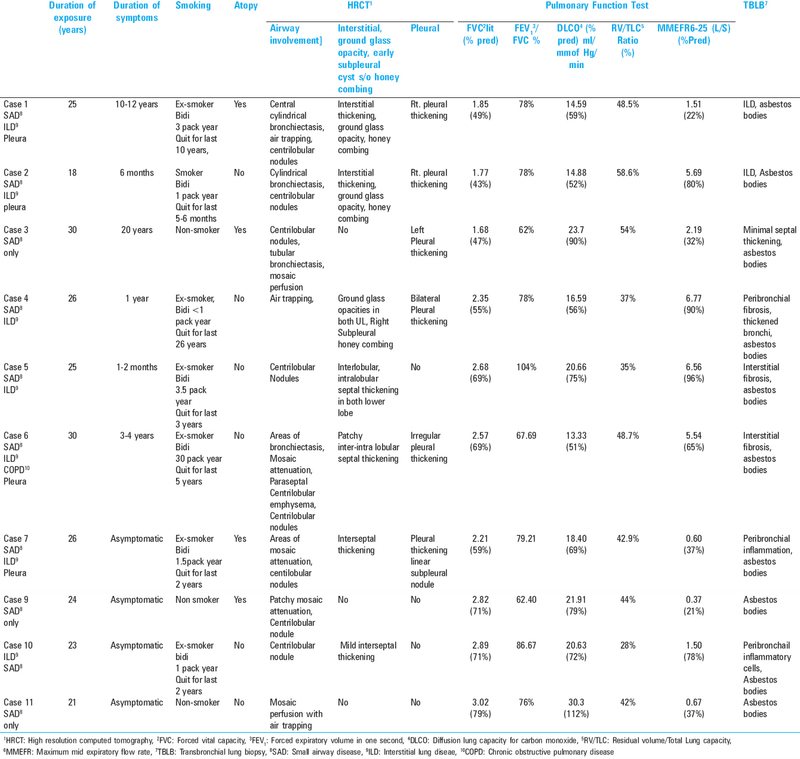 Eight out of 11 patients were symptomatic, and majority had complaints of cough with or without expectoration along with breathlessness ranging from few months to 18 years [Table 2]. Four out of 11 patients had atopic tendencies, 2 patients had significant smoking index, 6 patients had insignificant smoking history (smoking index <5 pack years), and 3 patients had never smoked. On general examination, 8 patients had post-exercise desaturation of more than 4% and 7 patients had clubbing. On respiratory system examination, 7 patients had basal crackles, 2 patients had rhonchi as well as crackles, and 2 had no respiratory abnormality. Routine biochemical and hematological examination were normal in all the patients. The spirometry of 11 affected workers showed mean FVC of 2.369 ± 0.467 L and 62.36 ± 12.26% predicted, the mean FEV 1 /FVC ratio of 75.109 ± 13.52%, and the mean of MMEFR 25-75% of 53.09 ± 28.96% predicted. The diffusion studies in these patients showed a DLCO of 18.75 ± 5.45 ml/mm of Hg/min and 69.81 ± 18.88% predicted, and the mean RV/TLC of 45.38 ± 9.98%. FVC was reduced in all 11 patients, 5 patients showed reduced FEV 1 /FVC ratio, 7 patients had reduced MMEFR. The DLCO was reduced in 8/8 patients, and ILD and RV/TLC ratio was increased in 10/11 patients with SAD [Table 3]. Out of 11 patients with asbestos-induced lung disease, 5 patients had bilateral lower zone haziness along with reticulonodular opacities, 1 patient had hyperinflated lung field, 1 had shaggy lung fields, and 4 had normal chest radiograph. On HRCT, all 11 workers with asbestos-induced lung disease had an evidence of SAD. Three patients had SAD alone, 6 workers had SAD with ILD, and 2 patients had ILD, COPD, and SAD. In patients with SAD and COPD, it was difficult to pinpoint that the etiology of SAD was due to asbestos-induced injury or small airways involvement because of COPD. An overlap of pleural thickening with or without calcification was observed in 6 patients. This overlapping finding is depicted in [Figure 2] as Venn diagram. All of the abovementioned 11 patients had presence of asbestos bodies on TBLB. The HRCT and histopathology images of few of the patients are presented in [Figure 3] and [Figure 4]. The remaining 3 asymptomatic workers who did not have asbestos-induced lung disease had a mean age of 38.33 ± 2.3 years, and mean duration of exposure of 22.66 ± 4.04 years. None of these workers were smoker or atopic. The mean FVC was 2.70 ± 0.046 L (70.33 ± 4.16% predicted). All 3 patients had low FVC due to poor performance; obesity and kyphoscoliosis in 1 patient each. The other parameters of spirometry and diffusion test were normal in these patients. The patients had normal chest radiograph and HRCT except for features of kyphoscoliosis in one of the workers. It should be noted that 3 of the workers with asbestos-induced lung disease did not have symptoms, 2 workers did not have any clinical finding, and 4 workers had normal chest radiograph. All those who were diagnosed to have asbestos-induced lung disease had low FVC, but even those without asbestos-induced lung disease had low FVC due to various reasons. Predicting the probability of various diagnostic modalities in patients with asbestos-induced lung disease in our study is presented in [Table 4]. Chest radiograph and spirometery were not useful for screening of asbestos-induced lung disease. However, RV/TLC and DLCO had good sensitivity and specificity for detecting nonmalignant asbestos-induced lung disease. Table 4: Predicting probability of various diagnostic modalities in patients with asbestos induced lung disease in our study. Workers suffering from the disease as well as those without the disease have been advised to quit smoking and/or not to smoke ever. They have also been informed about the harmful effects of asbestos and have been advised to use protective gears. All the workers with asbestos-induced lung disease have been given influenza and pneumococcal vaccine. Symptomatic patients with SAD are being treated with inhaled bronchodilators. These patients improved significantly with the treatment. They have been processed for compensation as well. Four of them have got compensation. The compensations for others are under process. The small-scale factory that we studied is covered under the Employee State Insurance Scheme (ESIS), which is tailored to provide socioeconomic protection to worker population and their dependents covered under the scheme. Though the factory workers were covered under ESIS, most of the workers were uninformed about asbestos and its ill effects. None of them were encouraged to undergo preventive health check up. It has been documented earlier that workers remain uninformed and untrained in dealing with asbestos exposure. In India, the use of asbestos has doubled in the decade 2000-2010 to approximately 300,000 tonnes a year by the industry that employs an estimated 100,000 workers. The health and safety legislations do not cover 93% of the workers in the unorganized sector where asbestos exposure is extremely high. If the workers covered under the ESIS do not know about asbestos and its handling, the state of the other workers must be dismal! Wang et al. has shown that there is a significant mortality risk, particularly from lung cancer and nonmalignant respiratory diseases, associated with exposure to chrysotile asbestos. Our study shows that chrysotile not only causes mortality (sentinel case) it also leads to significant morbidity if handling is improper. Overall, our study shows a glaring reality toward steps that are required to be taken for small-scale asbestos worker's well-being in India if not ban the chrysotile variety of asbestos altogether! Chrysotile variety of asbestos is used for a lot of items, e.g., roofing shingles, water supply lines, fire blankets, insulation materials, clutch and brake linings, gaskets, and pads for automobiles. The workers we studied belonged to a small-scale clutch-manufacturing factory. The process of clutch manufacturing requires steels, graphite, phenolic resin, and chrysotile asbestos fiber as raw materials. The manufacturing comprised mixing graphite and phenolic resin to form a graphite mixture. Subsequently, asbestos string is soaked and removed from graphite mixture, and then the string is bonded to the clutch facing. A high concentration of asbestos can be found in the clutch manufacturing factory. Mesothelioma and interstitial lung diseases have been reported in the clutch manufacturing industry. However, an exclusive evaluation of workers working in clutch manufacturing has never been done. The factory workers we analyzed for work-related injuries were evaluated because an index case had died of asbestosis. There have been large-scale studies evaluating the risk of asbestosis in exposed workers in various asbestos industries from India. ,, None of these studies have analyzed clutch-manufacturing workers separately. One of the studies from India done by Programme Objective Series (PROBES) in 2008 among asbestos workers showed exposure-wise prevalence of symptoms, signs, obstruction, and restriction. The prevalence was high in unorganized sector such as ours possibly due to the high level of exposure. In yet another study with a sample size of 625 where brake lining workers were included along with other asbestos workers showed that 6/153 (3.9%), 20/153 (13.1%), and 1/153 (0.7%) of brake workers had restrictive, obstructive, and combined defect, respectively. Brake manufacturing is similar to clutch manufacturing. Another study from Mumbai with a sample size of 182 showed that the prevalence rate of asbestosis in asbestos industry workers was 23%. In this study, the restrictive abnormality was shown to be higher (62%) than the obstructive abnormality (15%). In our group of workers, 11/14 (71.42%) workers had asbestos-induced lung disease, which is very high. There could be five reasons for the overall high prevalence of asbestos induced lung disease: (1) The sample size in our study was small because of which we could study them in much more detail with HRCT. The abovementioned studies have not used HRCT for screening. (2) Our workers belonged to the small scale unorganized sector, and hence possibly the level of asbestos at workplace was high. (3) Workers were unaware about the harmful effects of asbestos. (4) Many of them were smokers. (5) Workers were not provided with protective gears. All the affected workers had evidence of SAD on HRCT. SAD was in the form of mineral dust bronchiolitis or obliterative bronchiolitis causing centrilobular nodules and/or air trapping and/or mosaic attenuation on HRCT. Asbestos exposure has long been known to be associated with airway disease particularly SAD. ,, Epidemiologic studies have demonstrated a significant association between asbestos exposure and airflow limitation. ,,,, Peribronchial inflammation and fibrosis is known to occur in asbestosis. However, no studies have demonstrated a very high prevalence of SAD in asbestos workers. In fact, one of the studies had questioned SAD in asbestos workers. In this study, it was shown that there was absence of relationship of pulmonary function (FEV 1 , FEV 1 /FVC, or FEF 25-75% ) and cumulative exposure to asbestos. In the accompanying editorial, it was argued that possibly these workers were resistant to asbestos or the exposure was miniscule. Workers' resistance to asbestos was argued on the basis that the mean FVC of the population studied was 99.6% predicted after 27.7 years of exposure. The editor has also stated that such an unimpacted population would not show a dose-response relationship! Further, it was noted by the editor that with exposure greater than 20 years, only 10 workers had asbestos bodies. These 10 workers had significantly reduced FEV 1 and DLCO. Thus, the hypothesis that asbestos does not cause SAD seems to be incorrect. In our study, SAD was more common compared to ILD. This high prevalence of SAD could be due to the following factors: (1) Smoking: Smoking has been found to have compounding effect on small airway obstruction. Churg et al. had suggested that individuals probably differ in their susceptibility to asbestos-induced lung disease based on respiratory clearance. One of the factors they had identified was smoking. Eight out of 11 patients were ex-smokers, though only 2 of them had significant smoking index. Possibly small amount of smoke inhalation also leads to trapping of asbestos making them susceptible to small airway injury. (2) Atopy: Churg et al. in their study had also stated that there could be other unidentified hosts or environmental factors. In our study, 4 of the patients were atopic and one of these atopic individual was a nonsmoker. 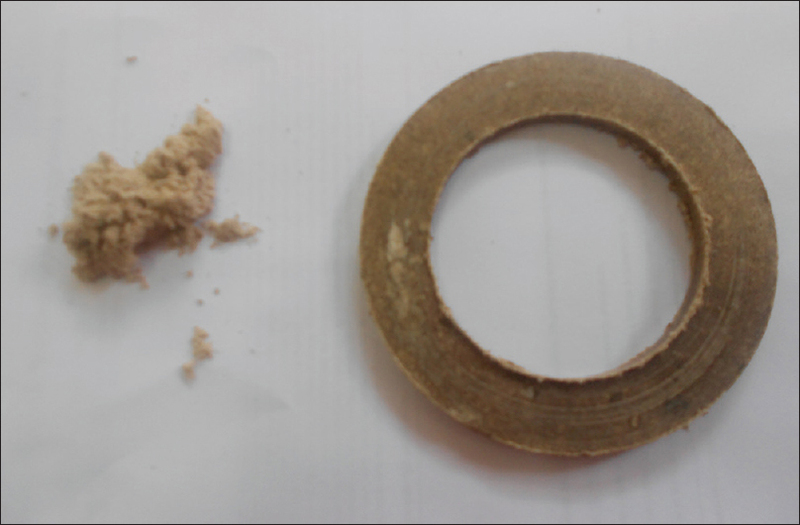 (3) Phenolic resin: It is possible that phenolic resin which is known to cause airway disease had an additive effect. The study described earlier with a subgroup of brake manufacturing workers using phenolic resin also had high prevalence of obstructive airway disease. (4) Small sample size: Due to small sample size, our group of patients could be studied in detail with RV/TLC and HRCT. (5) HRCT: Some of the studies done earlier have not used HRCT, and the studies which have used HRCT did not aim to evaluate SAD. Hence, SAD was not picked up which is otherwise easy to miss. Thus, smoking, atopy, phenolic acid, small sample size, and careful observation on HRCT possibly made us diagnose SAD more than the others studies. This finding also helped us in treating the patients with bronchodilators who were symptomatically better after the treatment. HRCT ,,,,,,,, has been evaluated for screening of nonmalignant asbestos-induced lung disease and is considered to be a more sensitive tool. The recent literature has also documented that chest HRCT findings significantly correlate with pulmonary function and mortality. However, its routine use for this purpose is not been recommended so far for nonmalignant asbestos-induced lung disease. Spirometry as a screening parameter for detecting nonmalignant asbestos-induced lung involvement is likely to miss both SAD and ILD. This is because MMEFR 25-75% measured during conventional spirometry for detecting SAD has very poor sensitivity and specificity. FEV 1 /FVC is the measure of large airway obstruction. Low FVC also has poor sensitivity and specificity. In our study, the sensitivity of chest radiograph, FVC% predicted, FEV1/FVC, and MMEFR 25-75% was 63.6%, 100%, 45%, and 63.6%, respectively. The specificity of the same parameters was 66.6%, 0%, 66.6%, and 100%, respectively. Hence, none of these parameters had both good sensitivity and specificity. On the contary, sensitivity of RV/TLC and DLCO was 90.9% and 100%, respectively, and the specificity of both the parameters was 100%. Very few studies have used RV/TLC ,, and DLCO , as a screening parameter. These studies have found them to be useful in assessing the severity. However, none have assessed their specificity and sensitivity for diagnosing nonmalignant asbestos-induced lung disease. Because the specificity and sensitivity of RV/TLC and DLCO is good, it can be very useful for screening of ILD and SAD, i.e., nonmalignant asbestos-induced lung disease if HRCT is not feasible. To conclude, we would like to state that chrysotile is not safe and requires to be regulated. Especially in small-scale industry strict guidelines regarding its handling and workers' protection needs to be laid down. Clutch manufacturing workers are possibly more prone to SAD and we can label this type of lung involvement, i.e., small airway, interstitial, and pleural involvement combined as "Clutch Plate Manufacturing Worker's Disease." Studies on screening of asbestos-induced lung disease should include at least RV/TLC and DLCO. Our study made asbestos workers aware about the harmful effects of asbestos and its preventive measures, which were not very well known to them earlier. Dr Supriti Kohli, HOD, Deapartment of Radiology, ESI-PGIMSR Delhi. Human Health Risk Assessment Studies In Asbestos Based Industries In India. Programme Objective Series: Probes/123/2008 -2009, Central Pollution Control Board (Ministry Of Environment And Forests). Available at: http://cpcb.nic.in/upload/newitems/newitem_135_human-health.pdf. [Last accessed on 9 th May 2016]. Study on health hazards/Environmental hazards resulting from the use of Chrysotile variety of Asbestos in the country. National Institute of Occupational Health, Ministry Of Chemicals And Fertilisers, Govt. Of India Sponsored Project. Available from: http://chemicals.nic.in/sites/default/files/Asbestos_%20NIOH_May%202012_0.pdf. [Last accessed on 9 th May 2016]. Chrysotile Asbestos, World Health Organization. ISBN 978 92 4 156481 6 (NLM classification: WA 754). Available at: http://www.who.int/ipcs/assessment/public_health/chrysotile_asbestos_summary.pdf. [Last accessed on 9 th May 2016]. Du L, Wang X, Wang M, Lan Y. Analysis of mortality in chrysotile asbestos miners in China. J Huazhong Univ Sci Technolog Med Sci 2012;32:135-40. Joshi TK, Bhuva UB, Katoch P. Asbestos Ban in India. Ann N Y Acad Sci 2006;1076:292-308. Cullinan P, Pearce N. The asbestos disease epidemic: Here today, here tomorrow. Thorax 2012;67:98-9. Wang X, Yano E, Qiu H, Courtice MN, Tse LA, Lin S, Wang M. A 37-year observation of mortality in Chinese chrysotile asbestos workers. Thorax 2012;67:106-10. Taptagaporn S, Siriruttanapruk S. Asbestos in Thailand: Country report. J UOEH. 2002;24(Suppl 2):81-5. Mesothelioma in Australia 2012. Alexandria (NSW): Cancer Institute NSW, Australian Mesothelioma Registry, funded by Safe Work Australia and Comcare; 2012. Available at: http://www.mesothelioma-australia.com/media/10743/amr-data-report_final-for-publication2013-1-.pdf. [Last accessed on 10 th May 2016]. Murlidhar V, Kanhere V. Asbestosis in an asbestos composite mill at Mumbai: A prevalence study. Environ Health 2005;4:24. Kennedy SM, Vedal S, Mu¨ller N, Kassam A, Chan-Yeung M. Lung function and chest radiograph abnormalities among construction insulators. Am J Ind Med 1991;20:673-84. Jodoin G, Gibbs GW, MacklemPT, McDonald JC, Becklake MR. Early effects of asbestos exposure on lung function. Am Rev Respir Dis 1971;104:525-35. Mohsenifar Z, Jasper AJ, Mahrer T, Koerner SK. Asbestos and airflow limitation. J Occup Med 1985;28:817-20. Ohlson G, Rydman T, Sundell L, Bodin L, Hogstedt C. Decreased lung function in long-term asbestos cement workers: A cross-sectional study. Am J Ind Med 1984;5:359-66. Wright JL, Churg A. Morphology of small airways disease induced by asbestos exposure. Hum Pathol 1984;15:68-74. Fournier-Massey G, Becklake MR. Pulmonary function profiles in Quebec asbestos workers. Bull Physiopathol Respir 1975;11:429-45. Rodriguez-Roisin R, Merchant JE, Cochrane GM, Hickey BP, Turner-Warwick M, Clark TJ. Maximal expiratory flow volume curves in workers exposed to asbestos. Respiration 1980;39:58-65. Wang XR, Yano E, Nonaka K, Wang M, Wang Z. Pulmonary function of nonsmoking female asbestos workers without radiographic signs of asbestosis. Arch Environ Health 1998;53:292-8. Barker AF, Bergeron A, Rom WN, and Hertz MI. Obliterative Bronchiolitis. N Engl J Med 2014;370:1820-8. Ameille J, Letourneux M, Paris C, Brochard P, Stoufflet A, Schorle E, et al. Does Asbestos Exposure Cause Airway Obstruction, in the Absence of Confirmed Asbestosis? Am J Respir Crit Care Med 2010;182:526-30. Miller A. Does Asbestos Exposure (Asbestosis) Cause (Clinical) Airway Obstruction (Small Airway Disease)? Am J Resp Crit Care Med 2010;182:444-5. Churg A, Stevens B. Enhanced retention of asbestos fibers in the airways of human smokers. Am J Respir Crit Care Med 1995;151:1409-13. Schoenberg JB, Mitchell CA. Airway disease caused by phenolic (phenol-formaldehyde) resin exposure. Arch Environ Health 1975;30:574-7. Vierikko T, Järvenpää R, Toivio P, Uitti J, Oksa P, Lindholm T, et al. Clinical and HRCT screening of heavily asbestos-exposed workers. Int Arch Occup Environ Health 2010;83:47-54. Lockey JE, Dunning K, Hilbert TJ, Borton E, Levin L, Rice CH, et al. HRCT/CT and associated spirometric effects of low Libby amphibole asbestos exposure. J Occup Environ Med 2015;57:6-13. Vehmas T, Oksa P. Chest HRCT signs predict deaths in long-term follow-up among asbestos exposed workers. Eur J Radiol 2014;83:1983-7. Tiwari RR. Agreement between chest radiography and high-resolution computed tomography in diagnosing dust-related interstitial lung fibrosis. Toxicol Ind Health 2015;31:235-8. Paris C, Benichou J, Raffaelli C, Genevois A, Fournier L, Menard G, et al. Factors associated with early-stage pulmonary fibrosis as determined by high-resolution computed tomography among persons occupationally exposed to asbestos. Scand J Work Environ Health 2004;30:206-14. Spyratos D, Chloros D, Haidich B, Dagdilelis L, Markou S, Sichletidis L. Chest imaging and lung function impairment after long-term occupational exposure to low concentrations of chrysotile. Arch Environ Occup Health 2012;67:84-90. Soulat JM, Lauque D, Esquirol Y, Déprés M, Giron J. High-resolution computed tomography abnormalities in ex-insulators annually exposed to asbestos dust. Am J Ind Med 1999;36:593-601. Falaschi F, Boraschi P, Antonelli A, Neri S, Bartolozzi C. Diagnosis with high resolution computerized tomography of early asbestos-induced diseases. Radiol Med 1993;86:220-6. Oksa P, Suoranta H, Koskinen H, Zitting A, Nordman H. High-resolution computed tomography in the early detection of asbestosis. Int Arch Occup Environ Health 1994;65:299-304. Weissman DN. Chest Computed Tomography in Prevention of Occupational Respiratory Disease: Review of Recent Literature. Semin Respir Crit Care Med 2015;36:433-48. Jeffrey I, Stewart, Gerard J. 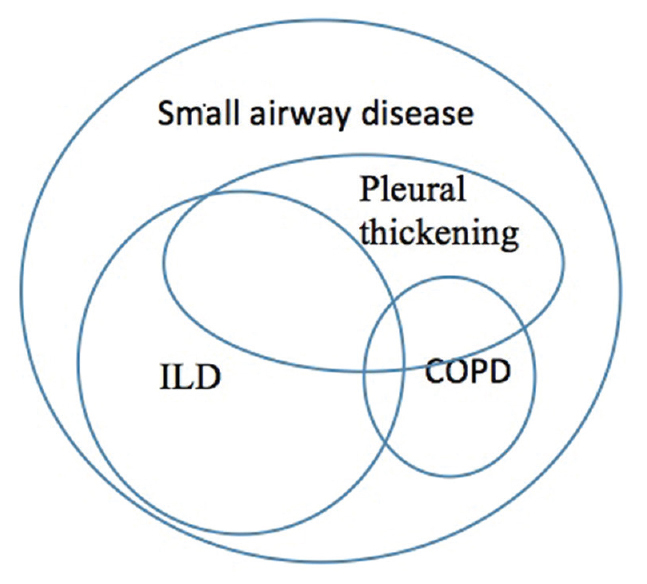 The Small Airways in Chronic Obstructive Pulmonary Disease Pathology and Effects on Disease Progression and Survival. Curr Opin Pulm Med 2013;19:109-15. Park EK, Yates DH, Wilson D. Lung Function Profiles among Individuals with Nonmalignant Asbestos-related Disorders. Saf Health Work 2014;5:234-7. Nogueira CR, Nápolis LM, Bagatin E, Terra-Filho M, Müller NL, Silva CI, et al. Lung diffusing capacity relates better to short-term progression on HRCT abnormalities than spirometry in mild asbestosis. Am J Ind Med 201;54:185-93. Sette A, Neder JA, Nery LE, Kavakama J, Rodrigues RT, Terra-Filho M, et al. Thin-section CT abnormalities and pulmonary gas exchange impairment in workers exposed to asbestos. Radiology 2004;232:66-74. Nair P, Rupawate RU, Prabhakaran LC, Bijur S, Kamat SR. Evaluating computed tomography and broncho alveolar lavage in early diagnosis of pulmonary asbestosis. Sarcoidosis 1991;8:115-9. Kilburn KH, Warshaw RH. Airways obstruction from asbestos exposure. Effects of asbestosis and smoking. Chest 1994;106:1061-70.